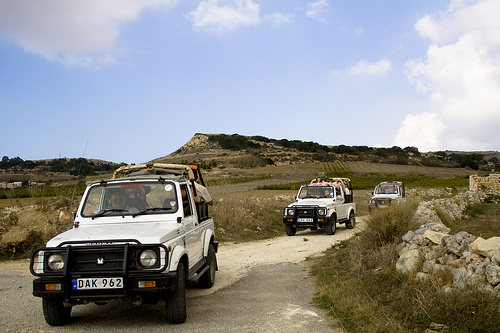 This very popular Jeep Safari is an ideal excursion where one visits all the highlights but also experiences the outskirts leading to the hidden gems of Gozo. Our professional Safari Leader will guide you to places that even some local people don’t know of their existence, unveiling scenic beauties and breathtaking views of the island including Xewkija Rotunda, Ggantija Temples, Ta’ Kola Windmill, Calypso’s Cave, Ramla Bay, Marsalforn and Xwejni Bays, the Salt Pans, Ghasri Valley, Gordan Lighthouse, Ta’Pinu Basilica, Azure Window, Inland Sea, Fungus Rock, Victoria, the Citadel, Xlendi Bay and also Qala Belvedere. Make sure you bring your cameras with you! Museum Entrance Fees, Lunch & Gozo Ferry Ticket are not included. Pick up and drop off from any Malta Hotel. Detailed English Commentary throughout the tour. A 9 Hour Jeep Tour around the island of Gozo.